Pupp played semi-professional soccer out east, began coaching girls’ soccer in Ladner in 1975 and continued coaching a couple of teams at a time when he started coaching women’s soccer at CapU. 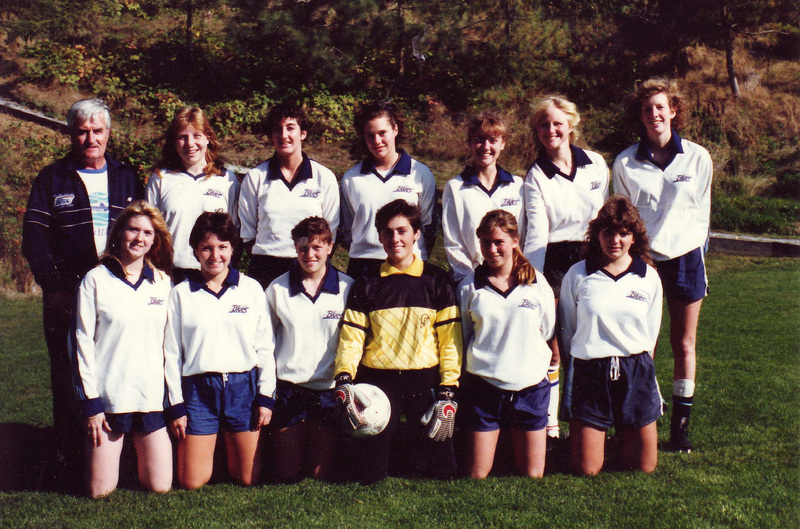 In 1991, the British Columbia Colleges’ Athletic Association (BCCAA), which is now the Pacific Western Athletic Association, named Pupp coach of the year for women’s soccer. Acutt was working for Club Med in Mexico when her mom mailed her a copy of the Sport Report, which highlighted this recognition for her dad. Acutt knew all about her father’s flair for coaching. He’d coached her childhood soccer teams and she chose to attend CapU mainly to be coached by her dad. She played for the Blues women’s team that won the BCCAA Conference in the 1987-1988 season. Neil Chester, athletic director for Cap at the time, says Pupp was skilled at developing and maximizing individual players’ skills while simultaneously building a team concept. For Pupp’s 70th birthday, Acutt and her two sisters planned a tribute party at Cap’s Sportsplex. Nearly 200 people attended, including women he’d coached in Ladner. Unfortunately, Pupp was too unwell to attend; he died a month later. But he passed knowing an award for women in soccer had been created at Cap in his name.